There are places where the Boa closure system makes the most sense—namely on whatever is on your feet while you’re wearing gloves. Louis Garneu’s Yeti Snowshoe is the first we’ve seen to use a BOA system instead of straps and buckles, and the system is much lighter than most. According to the company, the BOA closure gives the shoe an 80-percent reduction in weight over traditional snowshoe harnesses, and still delivers a secure and precise fit. The shoe will hit retailers in Fall ’13, and cost $250. Louis—our cold, blue hands salute you. Backcountry skiing is safest in groups, but anyone who’s ever gone with a crew knows how quickly everyone disperses in the trees. That’s why we love the idea behind Backcountry Access’s BC Link system. It’s a high-performance, integrated two-way UHF radio with a remote “Smart Mic” optimized for use in winter conditions designed to keep groups communicating and traveling safer in the backcountry. A great new tool for guides and skiers who ski long slopes one at a time. “Water repellent down” was the big story of Winter Market 2012 because it was such an innovation. It’s the big story of this year’s show because—it’s everywhere. You can’t spill a 5 o’clock beer at the Salt Palace Convention Center floor without it sloshing (with no ill effect) a coat stuffed with DownTek’s water-repellent feathers. DownTek is just ordinary down that is treated with a coating to make water run right off the down feather, instead of soaking it and turning it into a cold wad of feathers. Jackets and sleeping bags using the tech are remarkable—you can literally dunk the feathers in water and they come out totally dry, which is why 16 brands have adopted the technology for next season, including Mountain Hardwear, Big Agnes, L.L.Bean, Fly Low, NEMO, EMS, and Brooks-Range in North America. The coolest insulated jacket we saw this year was Outdoor Research’s Floodlight, which takes an ultralight waterproof shell (from the 6-ounce Helium II jacket) and stuffs it with 850-fill down wrapped in tissue-light Pertex fabric. The resulting combo is incredibly light and compressible—a true wet weather warrior built with the best stuff for cold. The problem with this sleeping bag is obvious: On a bitter winter morning, you’ll never want to get out of it. Nemo’s Canon -40 is a waterproof shell stuffed with 850-fill down, with Primaloft synthetic insulation in the footbox. It features a “stove pipe” opening to warm air near your face, with arm zippers to allow you some mobility—and so you don’t have to let a bunch of cold air in anytime you reach for some gizmo in the tent. 5 lbs; $1,000. Rossignol’s Super 7 ski changed the game in big mountain skiing, mixing stability and stiffness with a magical, rocker-fed surfing sensation for deep days, helicopter drops, and any array of off-piste conditions. Now, the Soul 7 (136/106/126) looks to up the ante with a new patented “Air Tip” technology designed to reduce swingweight, offer even more effortless flotation and steering, and (along with a lighter core) reduce the ski’s weight by 20 percent. In an all-mountain-encompassing assortment of 162-, 174-, 180-, and 188-centimeter lengths, $800 is what it will take for the “Soul” to get you to powder heaven. K2’s Kwicker Splitboarding System is like a highlight reel of products built to enhance backcountry riding. Built in conjunction with Voile‘s proven splitboard hardware, a long-deserved evolution of K2’ step-in Clicker binding design, and trick features such as Boa technology in the boots, everything here is proven to work rapidly and effectively in real on-mountain conditions. A kind of one-stop shop for any rider looking to go far beyond the boundaries (just add transceivers, snow safety gear and a good off-piste education), this is a real mainstream commitment to accessing the untracked. “Beast” is right! Dynafit’s new AT binding ratchets up to 16 DIN, with a rotating/tracking toe piece and a 6-degree ramp angle for an aggressive stance and alpine connection. Fashioned from the freeride sensibility of skier Eric “Hoji” Hjorfeifsonand the brand’s design technician Frederick Anderson, the Beast has a wider baseplate to drive bigger skis, and extra vertical movement to absorb, stick, and shralp in the biggest, gnarliest conditions. Hitting the streets with a $1,000 price tag, the Beast is ready to give the slopes (and your pocketbook) a serious beatdown. Too often roof racks are just mobile gear closets and bumper sticker billboards for everything you think is cool in the great outdoors. Not so with Thule’s Sonic Roof Box, which treats the theory of aerodynamics as if it were immutable law. This sleek box only sits 11” above the roof rack, and cuts through the wind with the patented AeroNose design, which includes golf ball-style dimples to reduce drag. The trademarked Hi-Flow Base allows more air to pass between vehicle and box, further improving fuel economy. It is now available at retail for $600. We love what the HeliDog Harnesssays about dog gear. Namely, that it can get both you and your pooch to bigger adventures in cooler places. Designed for rescue types who spring from helicopters with dogs at heel, the HeliDog harness is a lifting and winching harness that is soft enough to function as a soft working harness when the dog is running around on the ground. And even if you’re not putting your pup on belay, it’s certainly a great way to haul him up short scrambles so you can both make it to the top. $380. Chris Davenport’s journey from world extreme ski champion to peak grabbing mountaineer has helped set the edge of what is possible in big mountain freeriding. Now, in partnership with Scarpa, he could very well have designed a boot that does the same thing. The Freedom’s proprietary Carbon Core technology results in a 120 flex index that makes it easy to imagine dominating 55-degree couloirs, as well as 27 degrees of cuff range for a wide spectrum of motion and comfort when you’re skinning up to hit it again. Add in a weight of 3 pounds, 13 ounces per boot, and compatibility with any AT binding on the market, and you have backcountry’s next big step in a perfect mix of access and action. $770. Scott’s new lense change system is a really simple way to swap out lenses in just a couple of seconds, with or without gloves on. A quick flip of a lever on the right side and the lens swings out on a hinge built into the left (check out this video to see it in action). The Lens Change Goggle comes with an extra lens and a slim case that lets you protect it and pocket it, in case conditions change higher up on the mountain. Combined with the adjustable cams underneath the nosebridge, which fine tunes the goggle fit, the Lens Change Goggle deserves a close look next season. The problem with most beer growlers? They are made of glass, which makes them a bit nervewracking to transport, especially on a bike. Hydro Flask’s 64oz Double Wall, Vacuum Insulated Growler is made of double layers of stainless steel, and should keep beer (or water, etc.) ice cold for up to 24 hours. It will also keeps hot liquids (tea, coffee, etc.) hot for up to 12 hours, and has a wide mouth opening for easy pouring, both in and out (think soups & chili). For very similar reasons, we love Klean Kanteen’s new Insulated Pint Cup—a stainless steel, double-wall pint glass to help keep your cold beer protected from your hot little hands (although we gave the award to Hydro Flask because, you know, it can hold more beer). Cheers! 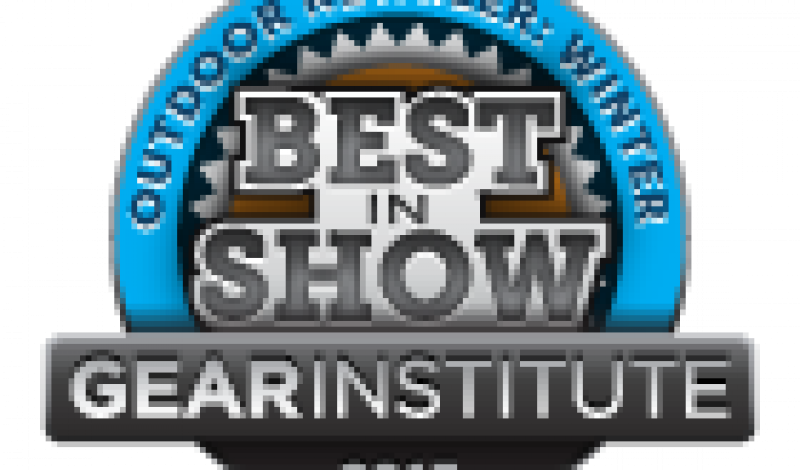 We saved a few of our Best in Show Awards to give to the products that everyone seems to be talking about on the floor at this year’s Outdoor Retailer. One new technology that’s generating some authentic buzz is Polartec’s new Alpha insulation. Short story, it’s a more breathable synthetic insulation—less prone to trapping humid air and better at wicking sweat out of a jacket than conventional “sheet” synthetics. Without going into all the wonky details, the Alpha insulation is built in a knit structure that allows designers to use woven face fabrics, even mesh, without worrying about the insulation threads slipping out. That means the jacket can be allow a lot more air to pass through. It’s a complex insulation, but the simple story is it should be significantly more comfortable and drier during aerobic and uphill efforts, with fewer layer changes. We’re looking forward to putting it to the test. Wow. You’ve gotta hold this jacket to believe it. It’s 5.2-ounce down sweater, stuffed full of 1,000-fill down, and wrapped in a 7-denier ripstop fabric. That’s the highest quality down we’ve ever seen, so lofty we would have been skeptical without seeing it for ourselves stacked next to its 800- and 900-fill competition. Montbell won’t say where the down comes from, but it has magically appeared in a down sweater that was light enough to be held aloft by a balloon in the company’s booth, and light enough that when dropped, it does not fall. It drifts downward. $269. When the directors of Mission Impossible 6 began looking around for a shoe Tom Cruise could wear to climb a skyscraper, they reached out to the designers at 5.10. 5.10’s rubber wizard Charles Cole took the challenge. He whipped up new, incredibly soft compound they’re calling Stealth MI6 (an homage to the Cruise flick that inspired it) which is being unveiled in Fall ’13 on three shoes—a flat-soled bike shoe called the Freerider VXi, a light hiker called the Ascent Elements, and a climbing shoe called the Team VXi, pictured above. Having felt the compound, it’s incredibly sticky and gummy—like no other climbing shoe rubber we’ve ever seen. By Cole’s own admission, it will be terrible for edging, but it ought to smear like a beast. We can’t wait to see what it will do for blank walls that are currently thought of as unclimbable. $170.